Friday Wrap-Up – Update from Railcar & ANBL, plus news from Petit-Sault, Acadie-Broue, Grimross, Celtic Knot, and more! • As well, Mr. Harriman confirmed that the ANBL is going to begin a pilot growler program in September, where they will be selling and filling growlers at three select ANBL stores in the province. He went on to verify: “We will only sell craft and import beer in growlers and will not sell any mainstream domestic beers in growlers.” If results are successful, they plan to expand this program permanently to 10-15 stores. We’re glad to see that things appear to have been settled for Railcar. As for the rumors that the new rule would be retroactive for all breweries in the province, Mr. Harriman assured us that “… it will be business as usual for all previously existing breweries, as they currently have Brewery Agency Store permits.” Let’s hope that more progress is made at the ANBL Board of Directors meeting next month to modify the current policy, so that future craft breweries are not hindered in any way. One future brewery we’ve mentioned previously, A.W.O.L. Brewery, met with the CBC to give their side of the story given the changed regulations. We’ll be following how it impacts them very closely, and remember that their crowd-funding campaign is still live, please check it out. Now, on to your regularly-scheduled program! • Les Brasseurs du Petit-Sault have announced that tomorrow, July 26th, they will be having their official grand opening… and we’re all invited! Hop in your car and head over to Edmundston, where they’ll be having tours of their brand new brewery between 11 am and 8 pm (the official ceremonies begin at 2 pm). Both brewers and all team members will be on hand to answer your questions about the brewery and their beers. Swag will be available for purchase, along with their beers, Tante Blanche and Bob LeBouef. • Speaking of Bob LeBouef, we thought we’d share some details on this new beer from Petit-Sault. It is just being released today for the first time, on tap and in bottles. Described by the brewery as being similar to a Belgian Blond Ale, it has a “full-bodied taste and generous froth, with a subtle hint of Saaz and Northern Brewer hops, leaving behind a delicate lace for a complete sensory experience”. It clocks in at 5.2% ABV, with 22 IBUs. Look for it on tap at the same locations in Edmundston as the recently-released Tante Blanche (Fraser-Edmundston Golf Club, Station 127, Frank’s Bar & Grill, Resto-Bar le Deck, as well as the Hotel Victoria in Saint-Quentin), and in bottles at their local ANBL stores and at the brewery. • And in even more exciting Petit-Sault news, they very-recently brewed a collaboration beer with Acadie-Broue. Patrice Godin, owner/brewer of Acadie-Broue, travelled to Edmundston this week to brew a batch of his Tintamarre, a Belgian Saison. We expect to see this beer released in August, and will share the beer recipe and availability details closer to that date. • Big Axe is also holding their grand opening soon at their brewery/Bed & Breakfast in Nackawic. On Saturday, August 2nd, they will be open from 12 pm – 9 pm for growler fills, and will feature live music from 5 pm – 9 pm via Julio’s Garage, a band from Fredericton. • We have more details on the newest beer from Grimross Brewing, Summer Serendipity. A slightly-hazy, straw-colored Belgian Ale, it has an ABV of 5.8%. With a grain bill of mostly Pilsner malt (along with some wheat and rye), the beer’s aroma is described by the brewery as “floral, with hints of lemongrass and tropical fruit”, and exhibits a flavor of “tropical fruit with a lightly balanced hop bitterness”. It’s currently available for growler fills at the Picaroons Brewtique. They’ve also sent out a teaser picture of the progress on their new brewery construction. • Celtic Knot Brewing is currently working on a new beer. Owner/brewer Bruce Barton has brewed Ring of Fire, a beer that includes smoked malt, ghost peppers… and possibly an addition of Srirachi sauce in the brew process. We’ll have more details on this beer as they emerge. Barton has also confirmed that he has added two new 101 L fermentors to his brewery to help meet increasing demand for their beers; hopefully we’ll see distribution expand soon! • Red Rover Brewing has confirmed they are releasing a new cider. Scrumpy is described by owner/brewer Adam Clawson as a traditional cider, non-filtered and still (no carbonation). Racked (transferred) four times to reduce the acidity, naturally drop the sediment, and allow for a longer maturation time, its described as being “dry, very smooth, and with a full mouthfeel”, and comes in at 7% ABV. It will be released this weekend at the Highland Games in Fredericton (on tap along with Spring and Summer), and at the Ciderhouse for flagon (1 L growler) fills. Look for a limited, special-edition flagon in the near future to celebrate the Scrumpy release. • Propeller continues to churn out beers for their One Hit Wonder series. This week, they’ve released American Red Ale, which is an American Amber of the U.S. West Coast type; think a hoppier version of the style. Weighing in at 70 IBUs and 5.7% ABV, the beer is hopped with Cascade, Columbus and Falconer’s Flight, with a malt bill containing 2-row, Melanoidin, Roasted malt, and wheat to provide some malt sweetness to help balance the higher bitterness. It’s available for growler fills now at both Prop Shop locations; look for it on tap at select establishments around Halifax as well. • Propeller is also taking part in two events as part of Local Connections’ Sausage Fest held August 14-24. We’ve already mentioned the return of the Prop’r Cask Night, 6:30 Friday August 15, featuring a feast by Chef Ludo of Agricola Street Brasserie. On Tuesday August 19th, at 6:30, they are taking over the taps at Lion & Bright for a Brew & Brats event. Eight different Propeller beers will be pouring, including several of their very popular One Hit Wonder beers, and other specialties. • What looks to become an annual tradition, Big Spruce has once again brewed up a batch of their Tip of the Spear, a “Black Spruce Tip IPA”. Incorporating fresh spruce tips from the Black Spruce tree, no hops are used for bittering… but the beer still comes in at about 63 IBUs! Don’t worry, there is some “huge late additions with Simcoe and Cascade hops”, along with a possible dry-hop addition, for hop aroma and flavor, according to owner/brewer Jeremy White. The beer should be ready for growler fills at the brewery in Nyanza in a little under four weeks. • The latest beer offering from the Newfoundland and Labrador Special Order Beer Club is closing this weekend. For those folks who would like to drink some MicroBrasserie Charlevoix, this is your only chance (short of heading West to the source). Choose from Dominus Vobiscum Blanche, Lupulus and Saison, as well as their Vache Folle Imperial Milk Stout and Rye IPA. Minimum order is 6 mixed bottles, be sure to contact Tom before the end of Sunday. • A reminder that Rockbottom Brewpub’s monthly Brewmaster’s Table dinner is being held Tuesday, July 29th. We previously released the menu for the evening, which includes the new Belgian IPA and a London-style Porter (usually only available upstairs at Your Father’s Moustache, but brewed at Rockbottom, as are the Red Duster Amercian Pale Ale and Apricot Wheat). Contact the brewpub to reserve your spot today! • A new bar/restaurant featuring craft beer has opened in Fredericton! 540 Kitchen & Bar, a gastropub located on Queen St. downtown, opened its doors late last month. With 10 taps available, they’ve recently had some local craft offerings available, including Hammond River Red Coat India Red Ale, and Big Axe Simon Saaz and Chanterelle Cream Ale. Management has confirmed that they will continue to expand their Atlantic Canadian beer offerings, along with other craft beers from across the country, and beyond. We’ve made a few changes to our website and online presence in the past few days, we encourage you to check them out, and let us know what you think. Firstly, we’ve added a page dedicated to the Brewnosers’ Good Beer Map, compiled and edited by AndyR and acbbChris, both members of the Brewnosers. We’ve added Facebook and Twitter Lists for you to follow, to keep up on Atlantic Canadian beer news, as it happens. And finally, we’ve created a Photo Album page, where we will post pictures of beer events and our travels, starting with our excellent time at the Picaroons Brewer’s Bash. Let us know what you think! The Artisanal Beer Club of Newfoundland, run by Tom Beckett and Mike Buhler, began in 2011. Their goal is to allow Newfoundland and Labrador residents access to a greater selection of craft beer than the NLC currently provides. The two men seek out great craft beer breweries, and offer their 800+ members the opportunity to try these beers not available in Newfoundland. It is really a win-win for the breweries and members, who would never normally be able to connect. Please check our profile on them from December for some more background, and how to join if you live in Newfoundland. I was recently in St. John’s, and luckily my visit was during a beer tasting put on by Mike and Tom at the Quidi Vidi Brewery (beautiful location in Quidi Vidi Village, a few minutes East of downtown St. John’s). They were pouring beers from Charlevoix, which came in as part of their second offering of beer to the club (their first was Dieu du Ciel!, and third that just closed was Flying Monkeys). Over 80 people were in attendance, and were greeted at the door by Tom (who writes “Beckett on Wine” for the NLC Occasions Magazine), who let us know the plan for the evening, and started us off with a ticket for a Quidi Vidi beer. QV’s new British IPA had recently been launched, so this was the first time many of us had the chance to try it. A solid British-style IPA with lots of earthy hop character, a great way to start the evening. 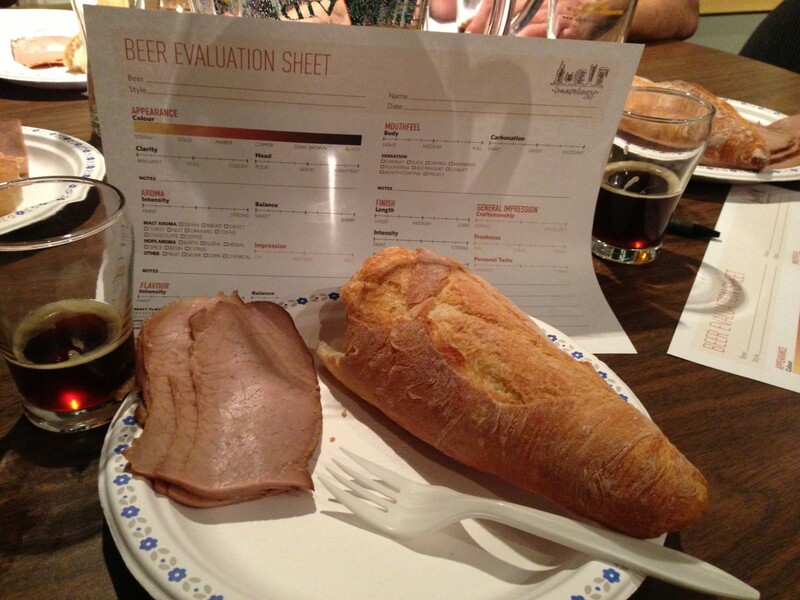 As we went to our seats, we found a great Roast Beef sandwich to help clean our palates between beers, and the wonderful Beer Evaluation Sheet, as created by Mirella Amato, a Master Cicerone. Mike encouraged us to fill out as much or as little as we liked on the sheet, and use it to help pick out the aromas, flavours and feelings we were getting from the different beers we’d be tasting. Over the course of the next two hours, Mike (whose website is Beerthief.ca), a Certified Beer Server himself (and going for his Certified Cicerone distinction), lead us through the tasting of four different beers from Charlevoix. We tasted their Dominus Vobiscum Double, Triple, their Vache Folle Imperial Milk Stout, and Dominus Vobiscum Hibernus. Double: 8%, copper in colour. Dark fruit (fig/raisin) on the nose, nice carbonation level, finishing with a bit of heat. Triple: 9%, golden. Some hops on the nose, with more alcohol heat and carbonation. Vache Folle Imperial Stout: 9%, dark brown. Lots of roast in this one, as well as a bit of sweetness from the lactose. Tons of chocolate in there too! Hibernus: 10%, light brown. The aroma on this beer is very berry-like (I got blueberry), thanks to the hard working yeast. At 10%, this would not be confused with a blueberry wheat beer, but it does make for an easy-drinking big beer. I can see this beer developing and aging quite nicely over a few years in the cellar. Cheers to the Newfoundland Beer group! I’d encourage all Newfoundlanders to sign up (send an email to Tom with your details, including the NL Liquor store closest to you) to hear the latest news as it’s released.